Words are a funny thing. I usually am not at a loss for them, but right now, when I feel like I need them the most, I can’t seem to find the right ones. I left on January 22nd for what I knew was going to be a challenging and emotional experience, but I never thought that one of my greatest challenges was going to be trying to express what happened on my journey. In September when I received the email about the Past is Present application process, I was certain that I had to at least complete the application. I knew that it would be a once in a lifetime opportunity to be at the 70th Anniversary of Auschwitz commemoration ceremony. I also knew that Auschwitz Birkenau was a place that I needed to see. I studied the Holocaust in college, and have been teaching the Holocaust to middle school students since 2001. I have learned many of the facts, read and watched many memoirs, viewed several documentaries, and heard the testimony of a number of survivors. In the 7th grade curriculum we dedicate a unit to the Facing History & Ourselves curriculum focused on the Holocaust and Human Behavior, so I have continued to study the events of the Holocaust, both the history and sociology perspectives. 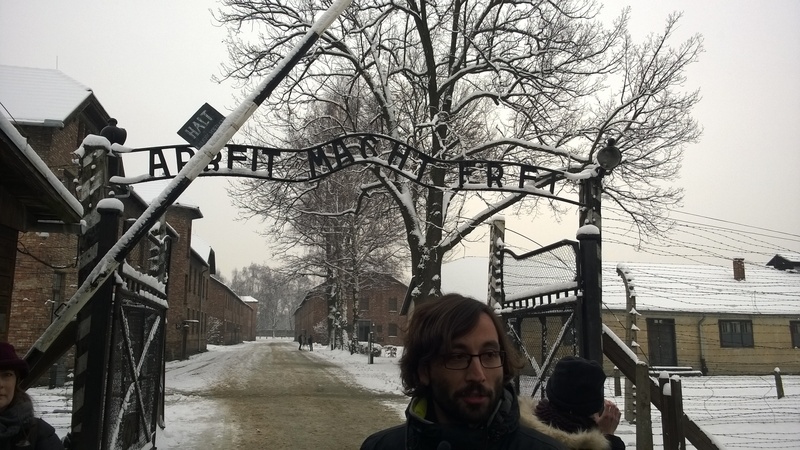 Traveling to Poland to be at the authentic sites of Warsaw and Auschwitz Birkenau felt like a necessary next step in my learning, and my professional development. I left expecting to learn, I did not expect to change as a person. What I experienced was not learning, although I did learn an incredible amount of information I did not know before. Standing in the Warsaw Jewish Cemetery, a cemetery that had once been part of the Jewish ghetto, and seeing the number of gravestones that were clearly tied to family plots, but yet were left half blank…no inscriptions…no additional family members, I was overwhelmed by the generations lost. When I walked through the gates at Auschwitz, I was overcome with the enormity of where I was. Walking down the paths through the blocks, on a cold January morning, I thought of the survivors I have talked to or whose testimony I have heard. How could a person survive one day in this place? One night? The hardest piece for me to process is the shoes. After walking through the room of the hair, hair brutally shaved from the head of innocent human beings whose crime was being Jewish, you enter the room of the suitcases. Thousands of suitcases with names and dates, and were likely filled with possessions of great emotional value, just piled up with the contents discarded. I was having a hard time with my emotions and the pain I was feeling so I turned the corner to find a space to gather my thoughts. There were the shoes. Little shoes. Shoes for a little child that had probably just learned to walk. Shoes that were stripped from a baby before being ushered to his or her death. I am not sure I will ever be able to forget the image of those shoes from my mind, and I am not sure that I ever should. As teachers we are tasked to teach our students not only the academic skills and content, but also help them make wise choices that better themselves and society. As a geography teacher, I am also tasked to bring the world into my classroom, and bring my students into the world. Traveling home, I am just not sure how I can bring this experience back to my students. I am not sure that what I experienced transcends words. Somehow I need to find the words. As I do, I will share them here. I feel it is my burden as a witness to what I saw and experienced. You’re doing it! You’re finding the words! My throat tightened up at the mere mention of the shoes. I’m so grateful that you got to go, and even more grateful that I’ll hear what’s next. I was so touched by you saying that it was hard to find the words, Tracy, but so proud of you that you are searching for those words and honored that I will be able to hear those words. I will wait for each installment as you find the words. Your students and those of us who know you will learn from your words and grow from the experience you had that you are sharing with us. Thank you.